We are pleased to offer you our finest, Premium Select Hawaii-Grown Macadamia Nuts. These gourmet kernels are hand picked on the beautiful Island Princess orchard estate, planted on the slopes of Mauna Kea on The Big Island of Hawaii. These Hawaiian Macadamia Nuts set the "gold standard" for all Macadamias grown in other countries around the world. 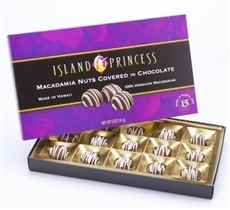 Learn more about why Island Princess Macadamia Nuts are so special click here.